SibFU scientists have developed a digital terrain model of the city of Krasnoyarsk and its larger metropolitan area. It can predict the spread of emergency situations of anthropogenic origin and natural disasters. The model will make it possible for experts to assess the potential of the air basin over Krasnoyarsk (the volume of the atmosphere, which determines the conditions for the distribution of pollutants under various meteorological conditions). „A high-precision terrain model is absolutely a necessity for Krasnoyarsk, a city that has a complex, basin-like terrain, of many sources of pollutant emissions, and a high repeatability of inversions“ — the director of the School of Ecology and Geography Ruslan Sharafutdinov noted. — „The increase in the concentrations of pollutants in the air of our city is observed during periods of unfavorable meteorological conditions, one of which is the temperature inversion in the atmospheric bopundary layer. In these conditions pollutants accumulate under the inversion "cover" and the thickness of the inversion layer determines the time it will take for the concentation of various compounds in the air to exceed the safe standards. One can find out how many hours will it take for the threshold limit value of a given substance to be exceeded by combining the digital terrain model with the inversion layer parameters. It brings new capabilities for prompt control of atmospheric air quality“ . IT experts took part in creating a map as well as ecologists. High precision of the map was achieved by using the remote sensing of the Earth surface technology. According to associate professor of the Department of Geoinformation systems, research deputy director of School of Space and Information Technology Alexey Romanov high-precision digital terrain models are becoming more and more widespread around the world: "Satellite data guarantees an extremely high-precision of surface objects display. Speaking of urban environment: examining the atmospheric dispersion of the pollutants, making the reliable model calculations of the atmospheric phenomena, assessing the damage caused by emergencies (in particular those related to toxic or radioactive substances) is impossible without a high-precision terrain model. In the future, we plan to keep working on improving precision. But the version we already have allows taking into account the effect the small sturctures produce on air mass movement" . Building a terrain model is essential for solving the model of the spread of pollutants in atmosphere. 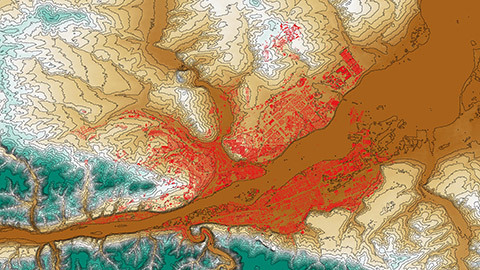 Due to this in order to enhance the precision the creators used different digital terrain models, open source ones that have an appropriate spatial resoultion for „exploratory modeling“ as well as business solutions that have an insignificant level of error in relative terrain elevation. Experts are convinced that the map is going to be useful for predicting and preventing natural disasters that are dangerous for the residents and urban infrastructure such as floods, landslides and smogging.